Long before sustainability became fashionable it was being practised on the shores of Warrane, the area known as Sydney Cove today. For thousands of years before the arrival of Europeans the local Aboriginal people had been hunting, fishing and gathering without destroying the natural habitat. In 1788 with the arrival of the First Fleet all that was about to change. The new settlers began to chop down trees and modify the environment to make it feel more English and to enable them to grow food. It was not their aim to co-exist with the Aboriginal people or with the environment. With the arrival of subsequent fleets and the growing population, the colony was under increasing pressure to supply itself with food. Importing food was expensive and the quality upon its arrival could not be guaranteed. The settlers had little concept of sustainability and instead were focussed simply on survival. 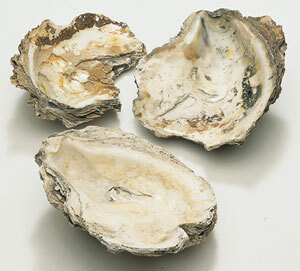 Sydney mud oyster shells recovered from archaeological excavations in The Rocks. Often growing to 25cm in diameter these oysters became extinct by the 1850s; prized for their abundant flesh, their habitat was destroyed by harbour reclamations, pollution and the construction of stone sea walls. This was the first time reference was made to looking after natural resources in the new colony. Throughout the subsequent years of development around the harbour and in The Rocks, conservation took on a different meaning. By 1973 Green Bans were imposed on a number of development sites in Sydney, including The Rocks, to preserve communities and the colonial history of Sydney. Following the Green Bans, the NSW Heritage Act was passed in 1977 and the Environmental Planning and Assessment Act in 1979. By the 21st century, our understanding of our impact on the earth had evolved to incorporate human-induced climate change. In 2009 Sydney Harbour Foreshore Authority (the State Government agency responsible for the care and management of The Rocks and Darling Harbour) adopted a sustainability policy to dramatically reduce carbon dioxide emissions and potable water consumption. The Authority aims to cut emissions and potable water consumption within the precincts it manages by 20 per cent by 2012 and by 80 per cent by 2020 based on year 2000 levels. There is no doubt that the sustainability journey will continue to evolve and we should all continue to fight for conservation of heritage and the environment we need to sustain us. 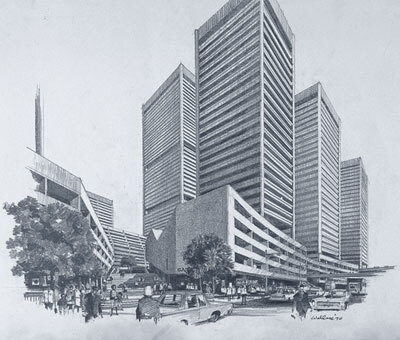 High rise proposed for The Rocks in 1970. Developments like this were the focus for the growing environmentalist movement in the early 1970s and culminated in the NSW Government’s Environmental Planning and Assessment Act in 1979.